About – Al's Backwoods Berrie Co. Welcome to Al’s Backwoods Berrie Co., We are a small family run business located in Historic Plymouth Ma.. Known as America’s hometown, The Mayflower, Plymouth plantation, and Plymouth Rock are just some of the history that can be found here. Although known for being one of the top historic vacation destinations in the country Plymouth is also a location full of great natural resource’s. Located on the inside edge of Cape Cod Bay our seafood is the freshest and small local farmers produce everything from beef to berries. We are home to some of the countries oldest cranberry growers, how could we not take advantage of all this and some old recipes to make some great homemade jams. 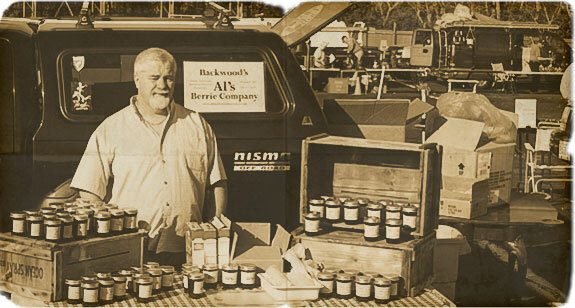 Our goal at Al’s Backwoods Berrie Co. is to produce the best homemade jams from the freshest ingredients. All our jams are made with local fruit when in season, out of season we buy only fruit sold by reputable suppliers. Our jams are made on site so we control the freshness and quality in every jar.